Voila! – Would I Wear it in Paris? The cape coat is finished, wearable and, above all, photographed. I am extremely pleased with this creation and the pictures. Thanks for taking them, Samantha! It’s cold and snowy in Vermont. But as long as you have the right gear you’ll hardly notice. The cape coat isn’t exactly right for the weather–we are getting ice coming out of the sky this weekend. Lalala. I don’t care though! 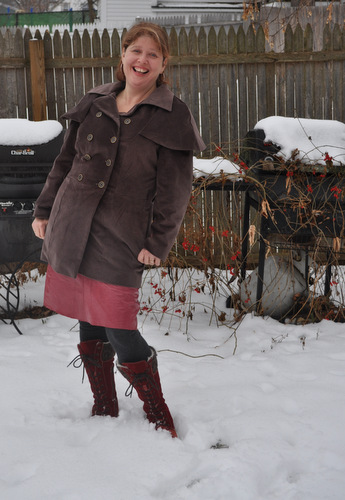 I have a velvet cape coat, a red leather skirt and toasty red boots. I want to mention the skirt for a minute. I didn’t make it exactly, but it is pretty different than the skirt I brought home from the second hand store a few months ago. For starters, it fits now. 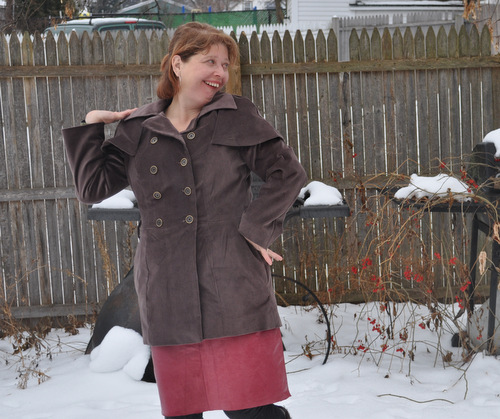 Also, if a red leather skirt could be frumpy, it was definitely frumpy when I bought it! I shortened it by cutting a couple of inches off the waist, and a couple more off the front hem. I made the hem in the back be longer than the front, a detail I have come to really like in skirts. I get to have the cute short skirt as well as enough skirt to sit down in. A lining reveal. If you have been assiduously following the Cape Coat Saga, you may remember that I chose a satin fabric for the lining of a deep ivory or champagne color. You may also remember (although I myself don’t remember mentioning it) that a big reason I could not justify the purchase of the papercut pattern was that the reviews said the lining instructions weren’t very good. What about the sweater, you might ask? It is Vignette by Amy Herzog. And there are more details over at my Ravelry. I probably won’t be able to wear my coat very much until March or so. I want to make a matching belt for it too. I wish I had taken a picture of my friend Samantha snapping pictures in the icy rain with a 5-month-old strapped to her front. It was awesome. You are totally charming! 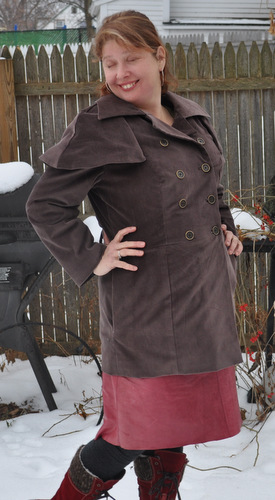 The coat is GREAT and I foresee years of good downtown walks in it for you. A very pretty coat! It takes time to do something right, and you didi just that! Thanks for sharing. Thanks! 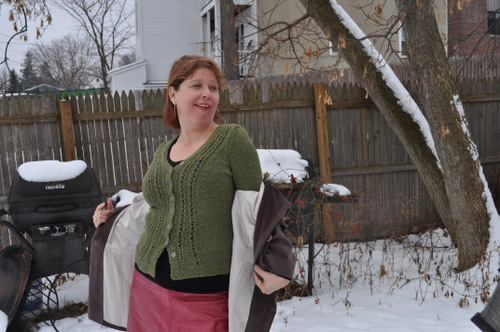 It helped that I wore it out and about a couple of times before calling it done. Ah, it’s gorgeous! I love the tiny capelet. It’s a lovely length and I can tell you’re totally chuffed! Funny you’d read things about the Papercut Watson’s lining, I thought that part was written really well ( I had issues with the capelet instructions, but that all in the past and almost forgotten now). Thanks! I am almost looking forward to March in Vermont just so I can wear it. Hey, look at that coat! Super. I love the “I made everything I’m wearing… almost” touch, this is much appreciated. Also, I came here though the Rav blog group, looks like you are up and running. Best of luck! Thanks, Dayana. Also thanks for letting me know how you came to my blog.